Data acquisition systems, as the name implies, are products and/or processes used to collect information to document or analyze some phenomenon. In the simplest form, a technician logging the temperature of an oven on a piece of paper is performing data acquisition. As technology has progressed, this type of process has been simplified and made more accurate, versatile, and reliable through electronic equipment. Equipment ranges from simple recorders to sophisticated computer systems, or even smart phones turned into portable data acquisition systems. Data acquisition products serve as a focal point in a system, tying together a wide variety of products, such as sensors that indicate temperature, flow, level, or pressure. OMEGA Engineering offers a wide range of data acquisition models in Taiwan. An electronic device that converts analog signals to an equivalent digital form. The analog-to-digital converter is the heart of most data acquisition systems. An electronic component found in many data acquistion devices that produce an analog output signal. Refers to a type of data acquistion signal. Digital I/O are discrete signals which are either one of two states. These states may be on/off, high/low, 1/0, etc. Digital I/O are also referred to as binary I/O. Refers to the way a signal is wired to a data acquisition device. Differential inputs have a unique high and unique low connection for each channel. Data acquisition devices have either single-ended or differential inputs, many devices support both configurations. Synonymous with HPIB (for Hewlett-Packard), the standard bus used for controlling electronic instruments with a computer. Also called IEEE 488 in reference to defining ANSI/IEEE standards. The smallest signal increment that can be detected by a data acquisition system. Resolution can be expressed in bits, in proportions, or in percent of full scale. For example, a system has 12-bit resolution, one part in 4,096 resolution, and 0.0244 percent of full scale. A standard for serial communications found in many data acquistion systems. RS232 is the most common serial communication, however, it is somewhat limited in that it only supports communication to one device connected to the bus at a time and it only supports transmission distances up to 50 feet. A standard for serial communications found in many data acquistion systems. RS485 is not as popular as RS232, however, it is more flexible in that it supports communication to more than one device on the bus at a time and supports transmission distances of approximately 5,000 feet. The speed at which a data acquisition system collects data. The speed is normally expressed in samples per second. For multi-channel data acquisition devices the sample rate is typically given as the speed of the analog-to-digital converter(A/D). To obtain individual channel sample rate, you need to divide the speed of the A/D by the number of channels being sampled. Refers to the way a signal is wired to a data acquisition device. In single-ended wiring, each analog input has a unique high connection but all channels share a common ground connection. Data acquisition devices have either single-ended or differential inputs. Many support both configurations. Bluetooth wireless transmitters that connect with smart phones or tables to log and monitor and record measurements, turning mobile devices into portable data acquisition systems. These transmitters measure different sensor inputs, including but not limited to pH, RTD, relative humidity. 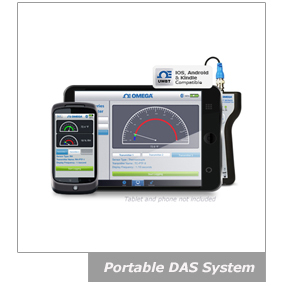 The data transmission is performed via Bluetooth wireless technology to a smart phone or tablet with the app installed. The app will allow the smart phone to pair and set up multiple transmitters. Wireless data acquisition systems can eliminate costly and time consuming field wiring of process sensors. These systems consist of one or more wireless transmitters sending data back to a wireless receiver connected to a remote computer. Wireless transmitters are available for ambient temperature and relative humidity, thermocouples, RTDs, pulse output sensors, 4 to 20 mA transmitters and voltage output transducers. Receivers can be connected to the USB or Ethernet port on the PC. Serial communcation data acquistion systems are a good choice when the measurement needs to be made at a location which is distant from the computer. There are several different communication standards, RS232 is the most common but only supports tranmission distances up to 50 feet. RS485 is superior to RS485 and supports transmission distances to 5,000 feet. The Universal Serial Bus (USB) is a new standard for connecting PCs to peripheral devices such as printers, monitors, modems and data acquistion devices. USB offers several advantages over conventional serial and parallel connections, including higher bandwidth (up to 12 Mbits/s) and the ability to provide power to the peripheral device. USB is ideal for data acquisition applications. Since USB connections supply power, only one cable is required to link the data acquisition device to the PC, which most likely has at least one USB port. Computer data acquisition boards plug directly into the computer bus. Advantages of using boards are speed (because they are connected directly to the bus) and cost (because the overhead of packaging and power is provided by the computer). Boards offered are primarily for IBM PC and compatible computers. Features provided by the cards can vary due to number and type of inputs (voltage, thermocouple, on/off), outputs, speed and other functions provided. Each board installed in the computer is addressed at a unique Input/Output map location. The I/O map in the computer provides the address locations the processor uses to gain access to the specific device as required by its program.